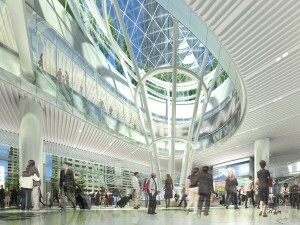 The 1 million square foot Transbay Transit Center is being built on the site of the former Transbay Terminal in downtown San Francisco and will serve 11 transportation systems: AC Transit, BART, Caltrain, Golden Gate Transit, Greyhound, Muni, SamTrans, WestCAT Lynx, Amtrak, Paratransit and future High Speed Rail from San Francisco to Los Angeles/Anaheim. 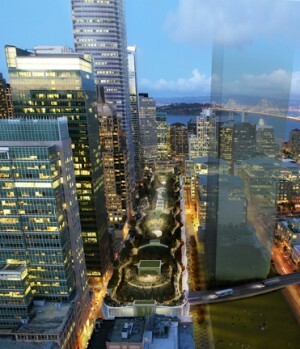 The new bus and rail facility will serve as San Francisco’s next landmark and will feature a 5.4-acre public park on the roof of the Transit Center. The first phase of the project will create a new five-story Transit Center with one above-grade bus level, ground-floor, concourse, and two below-grade rail levels serving Caltrain and future California High Speed Rail. Phase I will also create new bus ramps that will connect the Transit Center to a new off-site bus storage facility and the San Francisco-Oakland Bay Bridge. The building technology systems reside on a common network backbone with complete integration with the command and control center. HMA has designed the building management and control systems for the building.